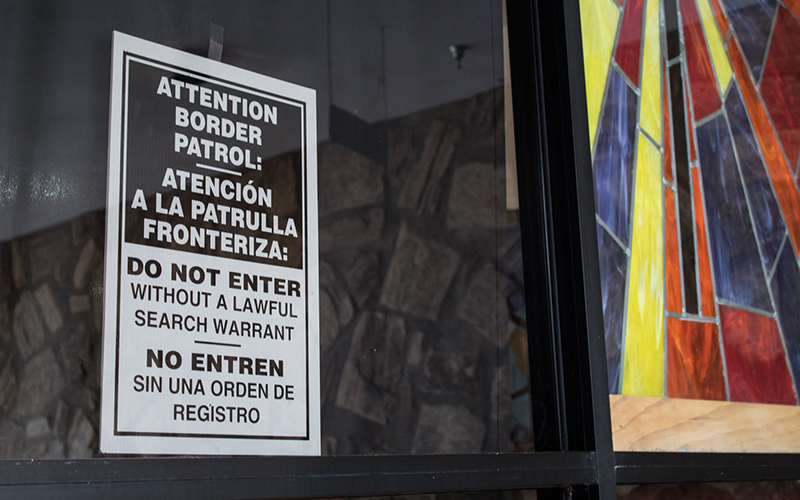 PHOENIX – Federal authorities on Monday granted Jesus Berrones, an undocumented father of five whose story has garnered international attention, a one-year stay on humanitarian grounds. Berrones, 30, had sought sanctuary at Shadow Rock United Church of Christ after U.S. Immigration and Customs Enforcement officials notified him they intended to deport him. After spending the weekend at the church, ICE issued a statement announcing the stay, calling it an “exercise of discretion.” The statement noted that the agency had granted Berrones a previous one-year stay, and he was required to regularly check in with local ICE officials. Berrones’ sister-in-law, Yesenia Garcia, said the family burst into tears when they heard the news. 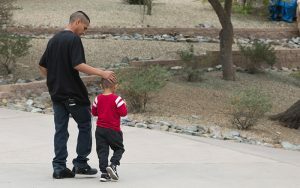 The Glendale resident made headlines after local news media outlets shed light on his situation: Berrones came to the U.S. from Mexico as a toddler. ICE officials told him to report for deportation on Monday. His wife, Sonia Garcia, a U.S. citizen, is pregnant. The couple care for the five children, including a 5-year-old boy, Jayden, being treated for leukemia. Garcia said Jayden didn’t want to leave his father’s side. Yesenia Garcia said Berrones returned home Monday afternoon, and he had planned to go back to the church Monday night to pick up his belongings. But the family described the time in sanctuary as an ordeal. Yesenia Garcia said Sonia Garcia had read the online comments about her husband over the weekend. When Sonia Garcia became distressed, the family decided to quit monitoring the news reports because they feared for her health. Berrones, an air-conditioner technician, took sanctuary at the church Feb. 9. The large room where he stayed was divided by a barrier. On one side, there was a pile of donated girls’ and boys’ clothes. On the other, a twin bed and shelves. Shadow Rock United Church of Christ is one of the hundreds of congregations that make up the national Sanctuary Movement, offering “spaces of sanctuary” to those facing deportation, according to the movement’s website. The Rev. Ken Heintzelman, senior minister, said the church had planned to give Berrones and his family a safe place for as long as he and his family needed it. “What we prefer to do is be an advocate and a companion with an attorney for a legal strategy for an administrative remedy,” he said. The Sanctuary Movement began in 2007, following the Sensenbrenner Immigration Bill, which resulted in thousands of workplace raids in 2006. In 2011, the movement worked for “prosecutorial discretion,” meaning ICE has the ability to grant deferred action depending on the case, according to a report by the Sanctuary Movement. Under President Barack Obama’s administration, “prosecutorial discretion” was granted by John Morton, the director of ICE at the time. The Obama administration issued a “sensitive locations” memorandum, ensuring enforcement actions would not be taken at such places as hospitals, schools and places of worship. In 2014, the first person entered sanctuary publicly and left 28 days later, with postponed deportation, according to a report by the Sanctuary Movement. 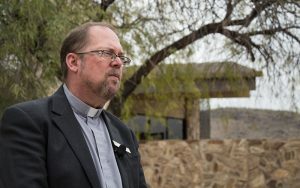 In January 2017, before the inauguration of President Donald Trump, the number of congregations signing up to become sanctuaries doubled from 400 to 800, according to the movement’s website. As of January, more than 1,100 congregations have become part of the movement. Shadow Rock United Church of Christ began offering sanctuary in 2014 with Marco Tulio Coss. Coss and his attorney had asked people throughout the Valley for refuge, Heintzelman said. Activists realized they could not house Coss without risking prosecution for harboring him. “It was like a group of volunteers like, ‘I need someone to step forward,” and everybody stepped back – and we were left standing there,” Heintzelman said. Shadow Rock decided as a congregation to let Coss stay, thus becoming a known place of sanctuary. And so when Berrones asked for sanctuary, the church granted it. Berrones, who said he has been deported twice before, said he had hoped ICE would cancel his deportation and let him go home. The statement said Berrones had spent time in federal prison on a criminal misdemeanor charge. Every month, Sonia Garcia and Berrones take their son for chemo treatments at Phoenix Children’s Hospital in Phoenix. Berrones holds his son so doctors can insert the IV. 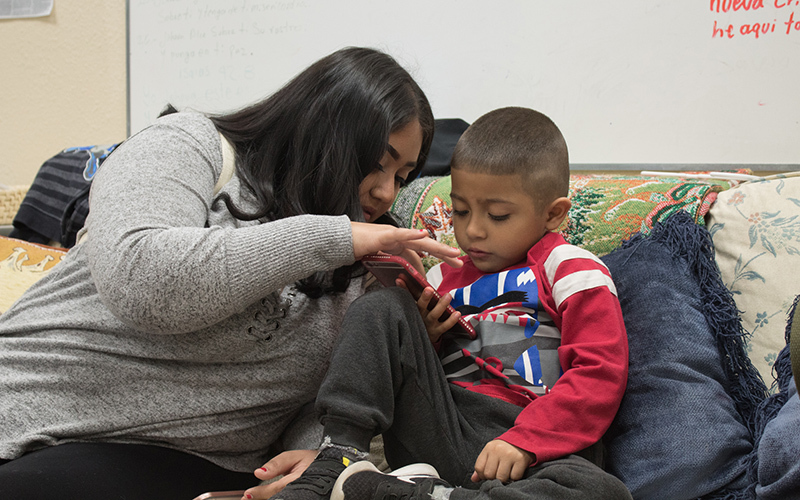 “I don’t think it’s fair that the decision they made, deporting him, because he has a family over here he needs to be there for,” Sonia Garcia had said earlier Monday. Heintzelman said the children had spent the night at the church, and they played outside on the church’s playground. But Jayden spent the most time at the church, Sonia Garcia said. On Monday, he held his father’s hand as they strolled outside, and he played Candy Crush with his aunt while his parents spoke to the news media. Cronkite News reporter Adriana De Alba contributed to this article.